I'm happy to introduce the Anemone Collection today! 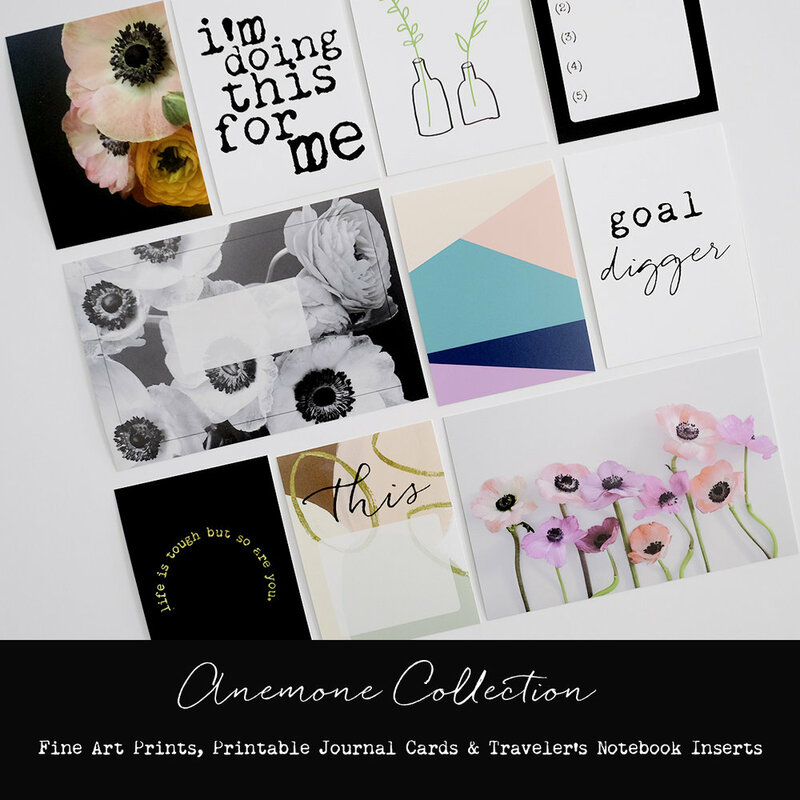 This collection includes fine art prints, printable journal cards, and printable traveler's notebook inserts. 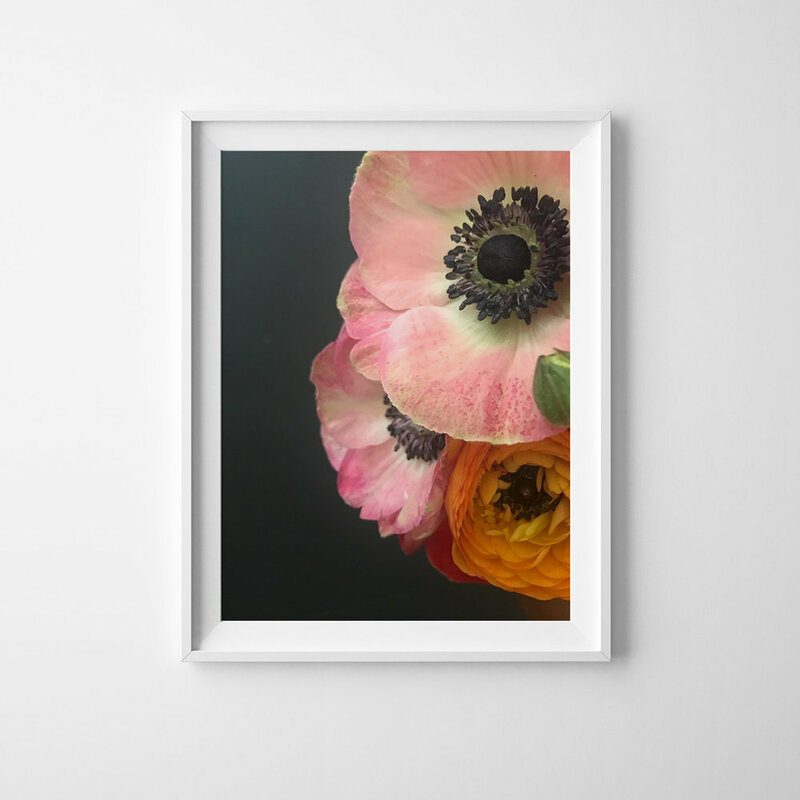 Three fine art anemone prints, all carefully printed on bright white, 100% cotton rag paper with archival inks. 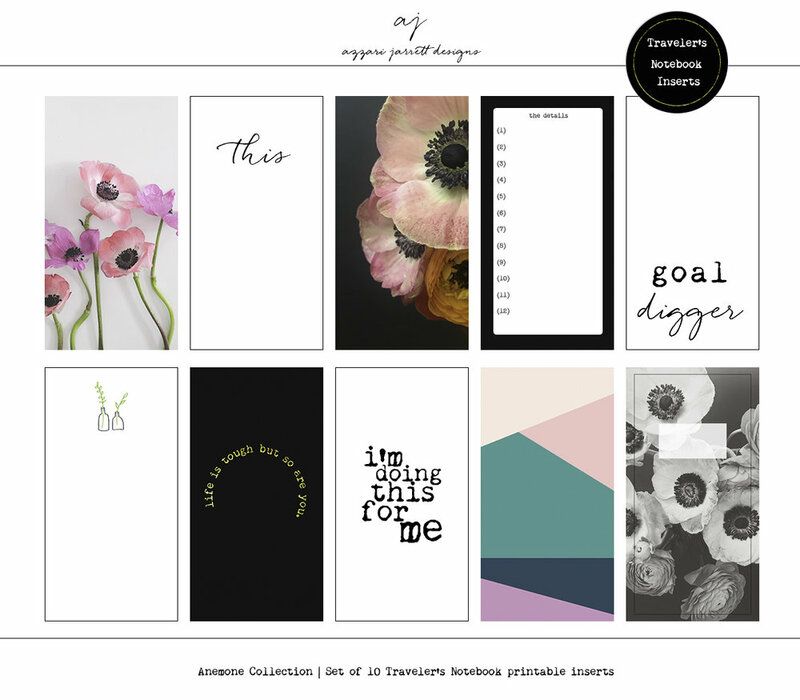 A set of 10 printable journal cards (8 - 3x4 inch journal cards, 2 - 4x6 inch journal cards) perfect for documenting. Included in the set are 2 high resolution PDF files, and 2 high resolution JPG files, all sized at 8.5 x 11 inches for easy printing. If you follow me on Instagram, you know that I've recently started documenting in a traveler's notebook, and I love the new format! If you document in this format as well, I have also included a set of 10 printable traveler's notebook inserts, sized at 4.33 x 8.25 inches. I hope you enjoy this collection, it is a work of love combining all the things I love - photography, design, and documenting. Please do tag me (@azzarijarrett) if you decide to use this collection, I would love to see it! One of my goals for this year is to update my little shop monthly with my creative work (photography, art, design, and documenting) from the previous month. 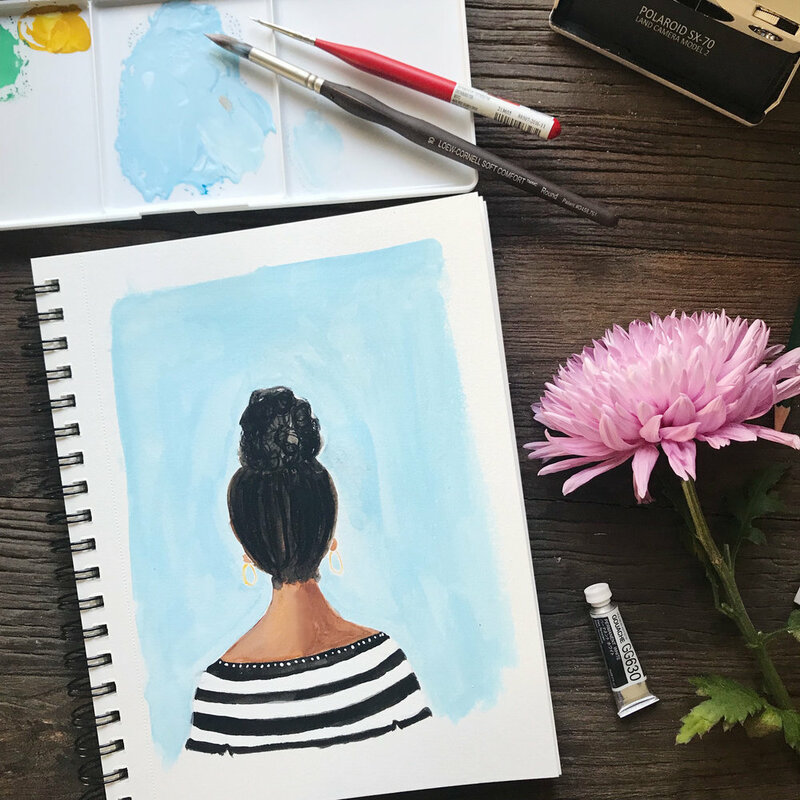 With my art, my intention is to include a bit more diversity in markets where not everyone looks like me - curly hair, brown skin. 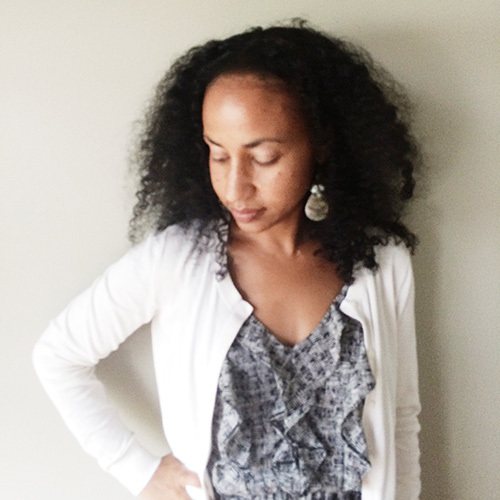 As a mother of three girls, I think it is important for them to see themselves reflected in my work. A peek from my sketchbook, below. 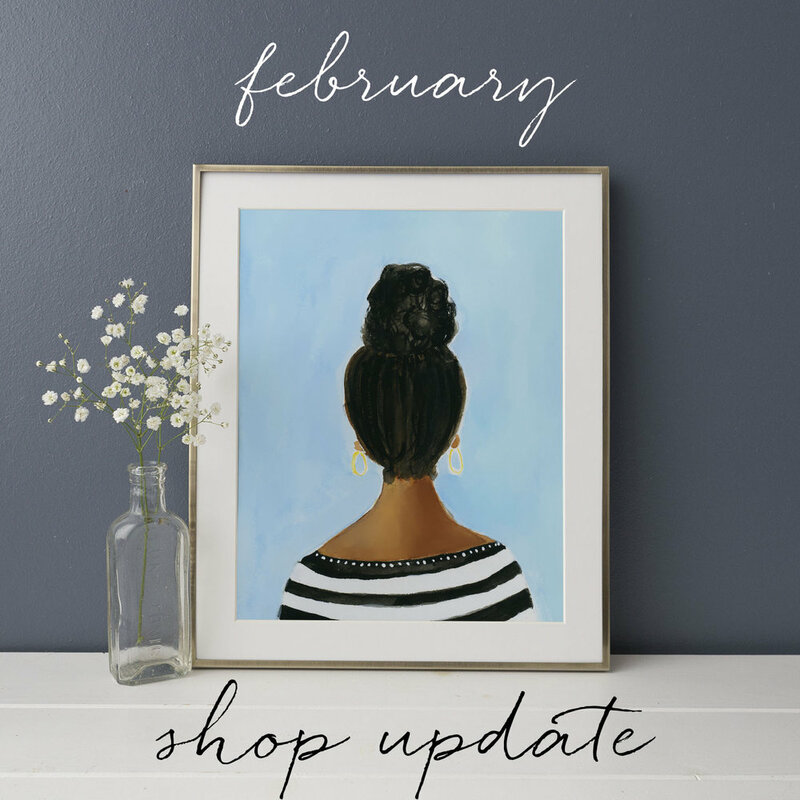 Take a look at February's release - including a few art prints, photography prints, and two sets of Project Life printable digital cards. Feel free to subscribe to my newsletter to be the first to know about my monthly updates in 2018. I hope that you find joy + inspiration from my work! I've been busy working on my small design shop over on etsy. Here are some of my recent designs - all available as digital art prints, so you are free to download and print immediately. And I really enjoyed working on a few designs for my hometown - Atlanta. Definitely thinking about making journal cards from these designs! And for my Project Life friends, a set of Love Journal Cards for documenting those special people or moments in our lives. These (and many other designs) now available in my etsy shop. January is pretty special to me. It's the start of a new year, but most importantly, it's my birthday month. To celebrate, I'm having a sale in my shop! 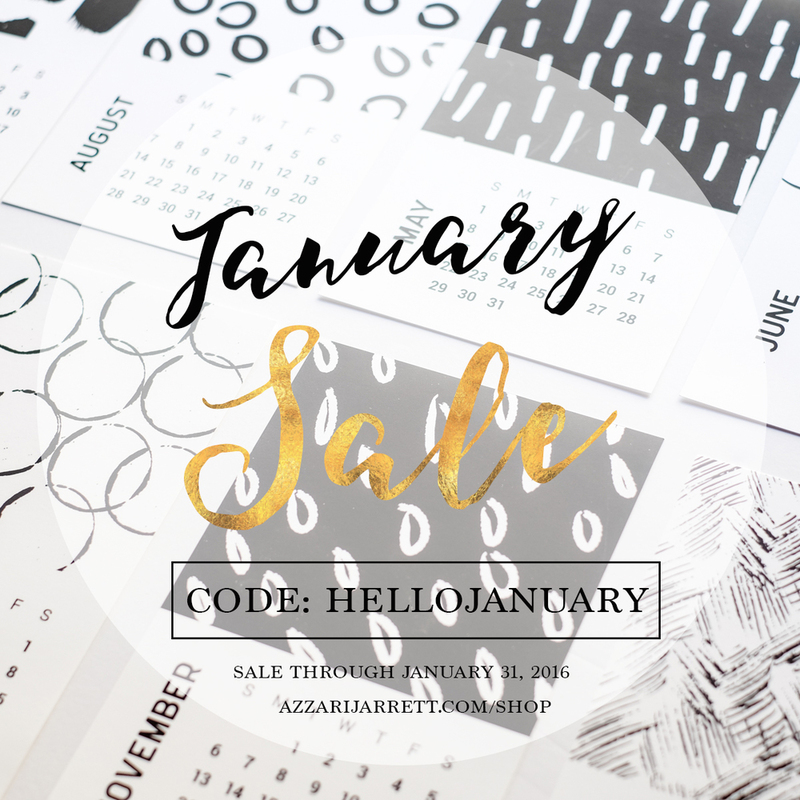 Through the month of January, please enjoy 25% off any of the digital goods in my shop. Use code: HELLOJANUARY at checkout. If you prefer to shop on etsy, you can find these digital products (and many more digital art prints) in my etsy shop as well - please use the same code. Also, the sale code can be used for On The Table, Volume 2 - a self published collection of my film photographs, all taken on my kitchen table (in stock and ready to ship). As always, thanks for your continued support of my work. And if you are anything like me, the upcoming new year definitely brings the urge to plan and make a fresh start with a new calendar. 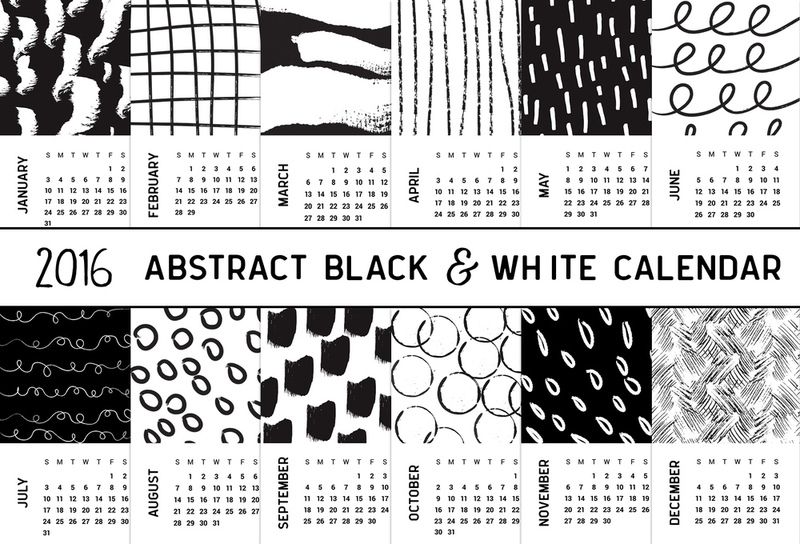 New in the shop is this 2016 Abstract Black & White Printable Calendar - I paired each month with a simple black and white pattern. If you like minimalist, abstract design - you'll love it! Each month is 5 x 8 inches, including a cover page. I printed this on heavy, card stock, and love the results. The calendar will be available for you to download immediately after purchase. Print at home or at your local print shop. Here's another look at each month. You can purchase your 2016 calendar here. I am clearing out the inventory in my shop for new (and exciting) products this Fall, which means all prints are now 30% off! Each film image is printed on 100% cotton rag using archival inks with a matte finish, available in two sizes: 5x7 inches and 8x10 inches. If you have had your eye on one of these photos from Crete, Greece - now is time to get it - they won't be available after Sunday, October 4! No code necessary, all prints are currently marked down. I am so excited to share my newest collection of fine art photography prints with you - Good Morning Crete! 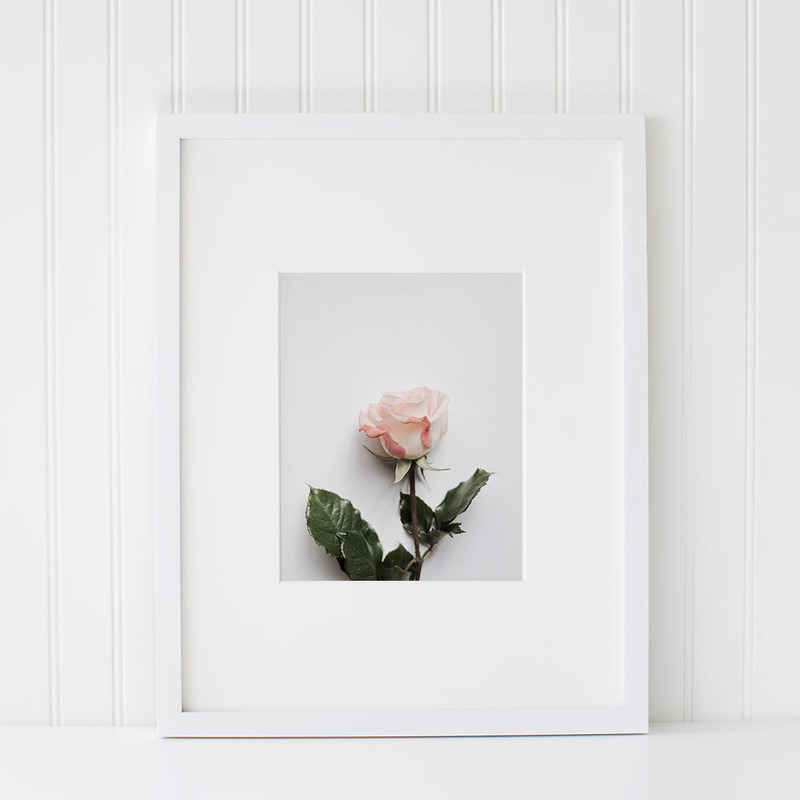 All captured on film, using my Contax 645 medium format camera, these images are perfect for your home, office, or inspiration board. Each image is printed on 100% cotton rag using archival inks with a matte finish. I guarantee you will love the quality of this paper. It is so good to see this work in print! This collection includes 4 fine art photography prints and 2 typography prints all captured while watching the sun rise in Crete, Greece. Each print is available in two sizes: 5 x 7 inches (12.7 x 17.78 cm) and 8 x 10 inches (20.32 x 25.4 cm). Larger sizes are available, please contact me. *Limited editions of 10 prints per size. "Do Less With More Focus" & "Breathe." Each print is hand signed and numbered, and will arrive in an acid free protective closure, secured in a flat mailer. And if you have been waiting to pick up your copy of On The Table, Volume 2, now is the time. It is on sale for $24 until August 31! As always, thank you for supporting my work! What's stopping you? More importantly, should you let it? This is the inspiration for my new collection of digital art printables - two art prints + journal cards. Download & print as many times as you like. I hope this serves as a reminder that you shouldn't let anything stop you and stand in the way of your hopes, your dreams, your talents - what you have to offer this world. 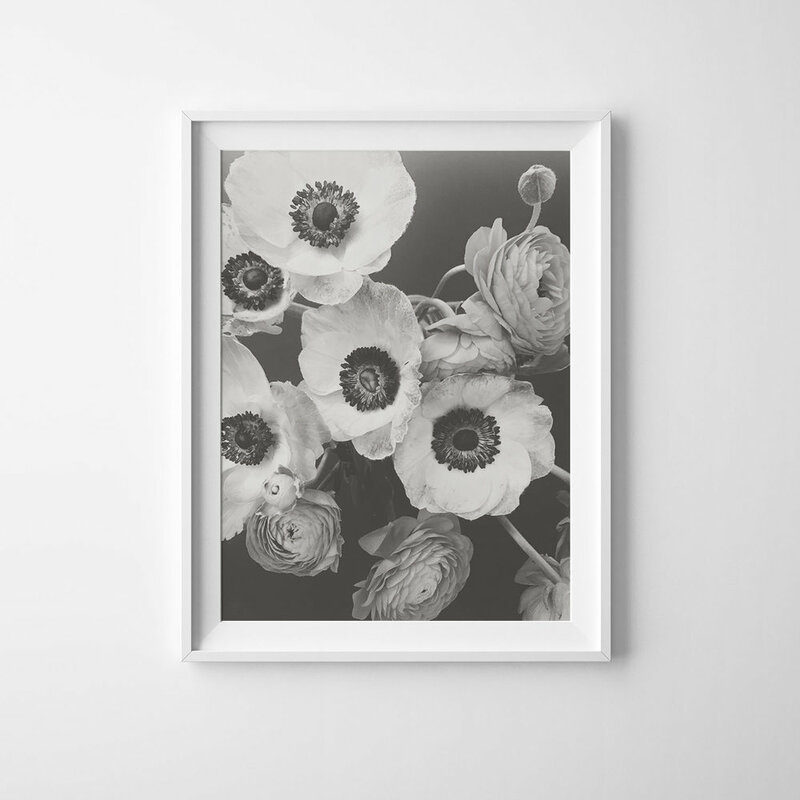 The simple black & white ranunculus image spoke to me as well. It is same as above, without the text. Both are available as digital art prints in my shop. 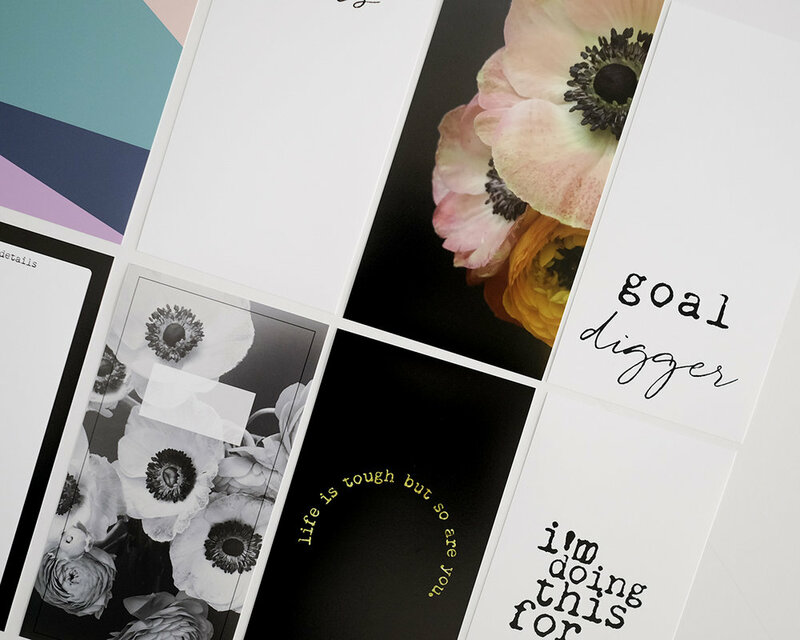 And for my Project Life friends, I created a few journal cards for this collection. Print them out in tuck them in your Project Life spreads, layouts, mini books, etc.